After the recent resumption of Nile cruises between Cairo and Upper Egypt, luxury travel company Abercrombie & Kent (A&K) is pleased to announce that the small and exclusive cruise ship, Sanctuary Sun Boat III, last month won best long cruise award from Egypt's Ministry of Tourism at its World Tourism Day event in Cairo. A&K reintroduced the long cruises between Cairo and Upper Egypt following the lifting of a 15-year ban on tourist traffic between the capital and Luxor by the Egyptian Ministry of Tourism earlier in the year. While the river highlights between the popular cities of Luxor and Aswan include a number of important temples, they are mostly from the Graeco-Roman era. Further north, in the area known as Middle Egypt, the sights are much older. One of the highlights of the newly opened stretch is Tel El Amarna, the capital of Egypt's heretic king Akhenaten and Nefertiti, which dates to 1353 BC. It was also the birthplace of Tutankhamun and when the boy king was crowned, he returned to Luxor with his treasure and Amarna was abandoned. Another attraction is at Beni Hassan, where a collection of rock-cut tombs depict painted scenes of everyday life still in vivid colour. From a much more recent era are the two Coptic monasteries. The Red and White Monasteries get their names from the materials used to build them. Each is home to important sculptures and paintings from the 5th to 14th centuries. Sanctuary Sun Boat III is a stylish and intimate vessel with a capacity of just 36 guests. Smaller than the average Nile cruiser, she exudes a style more exclusive club than cruise ship. Cabins are fully air-conditioned with panoramic windows and private bathrooms and the public areas are attractive and tastefully decorated. On deck there is plenty of space to soak up the river scenery plus a heated plunge pool. A fully qualified Egyptologist conducts uniquely tailored sightseeing in small groups of no more than 15, avoiding site visits at busy times. 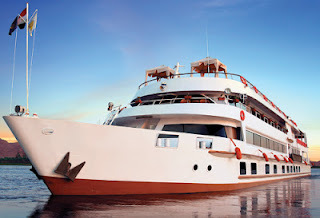 A&K's 15 day 'Egyptian Odyssey' includes the 10-night cruise between Cairo and Aswan on the Sanctuary Sun Boats III and IV with departures in April and June 2013.